Is Sierra Leone’s Bio Going After Corruption, or His Adversaries? 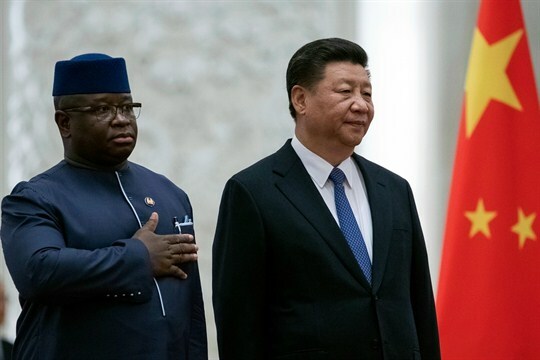 Chinese President Xi Jinping and Julius Maada Bio, president of Sierra Leone, stand during a welcoming ceremony at the Great Hall of the People, Beijing, China, Aug. 30, 2018 (Pool photo by Roman Pilipey via AP Images). In late October, a corruption inquiry into the activities of Sierra Leone’s former ruling party, the All People’s Congress, or APC, came closer to reality when a procedural vote in the APC-dominated parliament failed to block three proposed “constitutional instruments” establishing an investigative commission. The measures—all backed by new President Julius Maada Bio, who was elected after a closely contested two-round poll in March 2018—pave the way to investigate corruption by former President Ernest Bai Koroma and the APC, which had held power since 2007.